1. See the sunrise – at Gorleston. It’s one of the first places in Britain to catch the morning rays and after watching the molten sun crest the horizon, go for breakfast at one of the lovely cafes nearby. Eggs sunny side up, of course. 2. Build a sandcastle – at Snettisham. There’s loads of space for everyone to create their own castle, complete with ramparts and moat, and if you need inspiration there is the real Castle Rising barely a stone-skim away. 3. Go swimming – at Mundesley. Through the summer season, from May until Sunday September, there are lifeguards on the long sandy beach every day. There is also a promenade lined with beach huts, shops and cafes, car parking just across the coast road and just about everything you could need for a refreshing dip in the sea. 4. Go surfing – at East Runton. If the wind and waves are right, this is a fine beach break. Cowabunga dude! 5. Picnic – at Horsey. Lots of space for hampers, blankets, windbreaks, rugs. 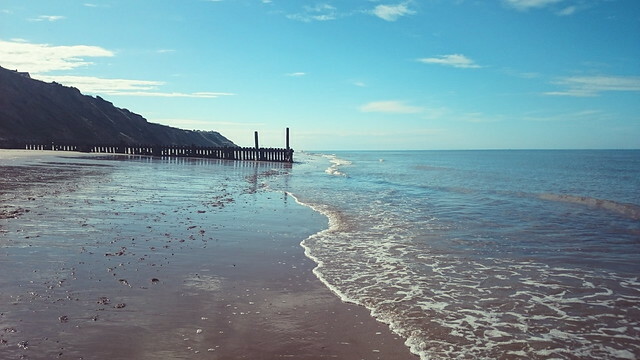 There are dunes for walking and sunbathing, miles of gently sloping beach for a dip, and if you’re lucky you’ll be able to do the Norfolk equivalent of swimming with dolphins and bob around alongside seals. 6. Traditional fun – at Great Yarmouth. From the wonderful wooden rollercoaster of the Pleasure Beach to the spectacular circus and water shows of the Hippodrome, from the 2p machines of the arcades to the model village and snails of the seafront. And that’s without mentioning the fantastic white sands of Yarmouth’s famous beach, so huge it’s rarely crowded and always great! 7. Play cricket, or rounders, or boules – at Sheringham. And if the tide is in and the beach has disappeared, don’t panic! Enjoy some fish and chips on the seafront while you wait for your sandy pitch to reappear. 8. Try skinny dipping – at Holkham. Walk far enough around the bay and the sunbathers on the white sands might have some whiter bits than most. But most people on this enormous beach are clothed and it is ideal for swimming, paddling, shell-hunting, dog-walking, horse-riding, even foraging for razor clams. 9. 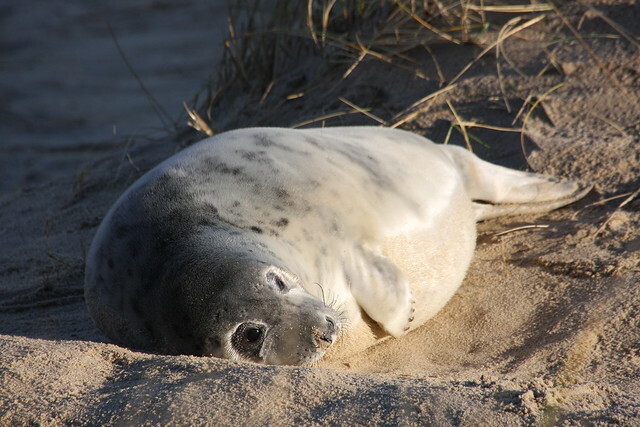 Take a boat trip – to see the seals from Morston or Blakeney, or go sea fishing from Brancaster Staithe or Wells, and in Hunstanton hire sea kayaks or take the Wash Monster amphibious vessel out to seal-strewn sandbanks. 10. Go crabbing – at Wells. Hang a bacon-baited string over the edge of the quay and keep your crabby catch in a big bucket of water until it is time to (gently) tip them out and let them scuttle sideways back to the sea. 11. Go body boarding – at Cromer. When the waves are right – not too tiny, not too gnarly – the sun is shining and the tide is low, there is nothing better than flying towards shore surrounded by foaming water. Wash up in the shallows, pick up board, admire the fabulous view of pier, church tower and Hotel de Paris, and plunge back out to sea to wait for the next perfect wave. 12. Go sea dipping – at NWT Holme Dunes. See what beasts the sea has to offer at Holme. Staff will go dipping in the sea and bring their fascinating creatures to shore for kids to observe. Please arrive 15 mins early to sign up. £3.50 for non-NWT members. Booking essential at 01603 625540. 13. Go rock pooling – at West Runton. Twice a day the tide uncovers rocky shelves around the beach, leaving tiny watery worlds, alive with anemones, shellfish and crabs. This is the visible part of Europe’s biggest chalk reef, most of which lies just off the coast. On several days throughout August, the Norfolk Wildlife Trust is running free rock pool rummaging and a rock-pooling event on 11th August at West Runton called Barnacles and Belemnites (the fossil of an extinct prehistoric squid-like animal). £6 for non members (+1 free accompanying adult). Booking is essential for Barnacles and Belemnites. Call 01603 625540. 14. Go paddling – at Happisburgh. Follow in the footsteps of the earliest known humans to live in the British Isles and paddle across this lovely sandy beach. The 800,000-year-old footprints of adults and children were found here in 2013. 15. See the sun set over the water – at Hunstanton. The sky lights up in shades of pink, orange and red as the sun slips beneath the waves. 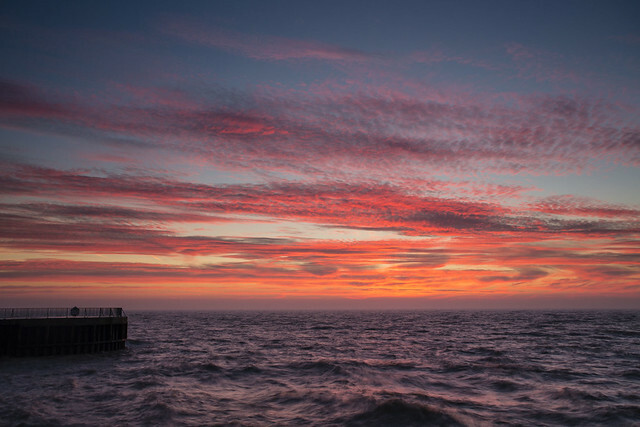 But it is not just at dusk that Hunstanton sparkles with colour – there are striped red and white cliffs, ginger carrstone houses and flower-filled parks and gardens, and after sunset the resort lights up for an evening of seaside fun.